The projector is an upgraded one with 2200 lumen, 50000+hours lamp and contrast of 2000:1. Wrong User Manuals are put in some packages by mistake. The issue will be avoided in new items. Please rest assured. Why there is no sound coming out from the projector? Solution 1.Please confirm whether the projector has sounds when it's not connected with other devices. If it has sounds, the HDMI cable should be defective. Please exchange that cable. Solution 2. Please check whether the movie you are watching is a Dolby sound one. The projector does not support the Dolby sound. Please do not use it to play movies. Projection Type: Mini Home Theater Projector. Supported Resolution: 480P, 720P, 1080P . Power Voltage AC in: 100V~240V, 50/60H. Aspect Ratio: 4:3 / 16:9 Uniformity of light. TF card Maximum support: 64G. Hard disk Maximum support: 250G[need extemal power supply]. Port: USB input* 1. TFcard input* 1, AV* I. HDMI input*1, VGA input*1. HDMIVGA/AV: 576i 720P.720, 1080i, 1080P. Supported Video File Format: MPEGl/MPEG2/MPEG4/RM/RMVB/MOVIMPEG/DIVX/VOB/MKV. 1 x Mini Video Projector. 1 x AV Signal Cable. ★NOTICE: The projector is an upgraded one with 2200 lumen, 50000+hours lamp and contrast of 2000:1 Wrong User Manuals are put in some packages by mistake. Please rest assured. Not recommend to use for presentation or PPT. ★MULTI-MEDIA CONNECTIVITY & NOISE SUPPRESSION & HEAT DISPERSION: This projector has HDMI, AV, VGA, TF Card ports which make it available to connect with iPhone, iPad, Android Phones, Amazon Fire TV Sticks, PS3, PS4, X-box, Wii, PC, Laptop, TV box, Blue-ray DVD Player, TF Card, USB Flash Drives, Chrome Book, etc.With advanced fan cooling system, it will not get as hot as other projectors. 70% of the fan noise will be reduced for the noise suppression technology. ★BIG SCREEN & EASY TO SET UP: Its projection distance varies from 4.9 to 16.4 feet with 40 to 170 inch watching size. The recommended watching distance is 8.2 feet with 100 inch screen. Just turn the projector on, connect it with your device via cables, and control the playing via the remote. A detailed user manual is also included to guide you how to operate it. Better for watching movies, videos, pictures or gaming. ★3-YEAR 100% MONEY BACK GUARANTEE: This mini video projector provides hassle-free 3-year 100% money back guarantee. If you need any help, just contact our customer service team and a satisfied solution will be provided in 24 hours. 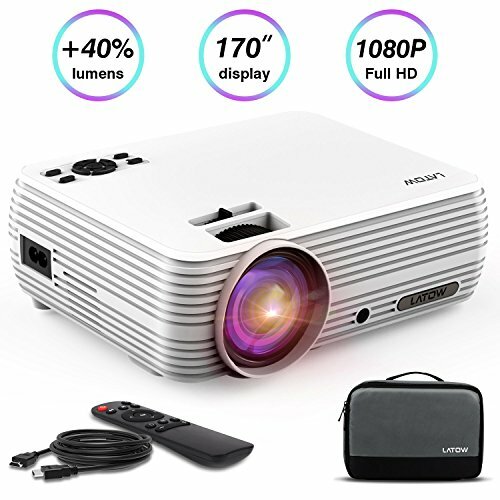 ★IMMERSIVE WATCHING EXPERIENCE: Supporting full HD & 3D videos and pictures with 2200 Lumens and 1920*1080 resolution, this mini video projector provides more of a movie theatre experience with excellent color rendition, exquisite details, and adequate brightness. Dual powerful 2W built-in speakers are designed to bring you a more fulfilling sound experience. Ideal for movie nights, birthday party, and family gathering. Just use it to play games, watch movies, YouTube videos, football matches. View More In Video Projectors & Accessories. If you have any questions about this product by LATOW, contact us by completing and submitting the form below. If you are looking for a specif part number, please include it with your message.